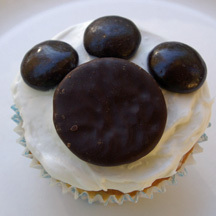 Inspired by a recent article in Family Fun magazine, these cute black-and-white cow cupcakes are a great addition to a barnyard or farm-themed birthday party, ho down, or any cupcake cattle call! What You Need: 1 cupcake; white frosting; 2 Junior Mints; 1 pick candy wafer; 2 mini brown M&Ms; 2 white jellybeans; black writing icing in tube. How to Make It: Frost cupcake. 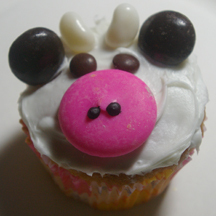 Use writing icing to make two dots on pink wafer for nostrils and place near center bottom of cupcake. Place Junior Mints, angled upward, near top of cupcake. Add jellybean horns and mini M&M eyes. 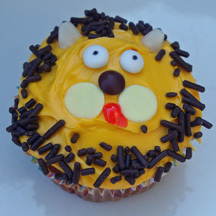 If you don’t worry about being perfectly accurate with your cupcake mammals, this pawprint cupcake could pass for a bear, dog, cat or other creature. 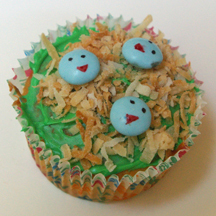 What You Need: 1 cupcake; white frosting; 1 mint patty (such as Necco); 3 Junior Mints. How to Make It: Frost cupcake. Arrange 3 Junior Mints above large mint. 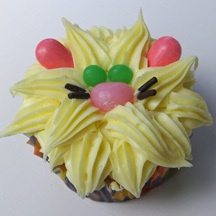 The standout feature of these cute lion cupcakes is in the mane. You’ll need a star tip (#22 is good), but making the mane is easy. How to Make It: Frost cupcake. 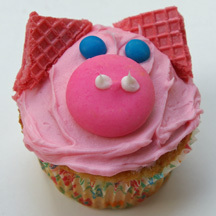 Use star tip to pipe long stars around the edge of the cupcake, and then repeat farther inward on the cupcake. Don’t stop squeezing as you pull away, so the ends of the stars will have pointy tips. 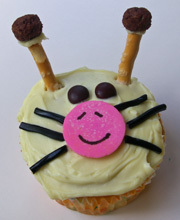 Place pink nose, green eyes and 4 chocolate sprinkles for face. Add 2 dark pink jelly beans for ears.